For those seeking insights into the challenges facing American healthcare and the complexities involved in health reform, last week’s hearings in various congressional committees and subcommittees provided a wealth of information. I want to thank WPTF Radio of Raleigh, NC for inviting me on the air yesterday morning to discuss health reform. It was a good opportunity to talk about the possible impact on physicians, hospitals and patients if Medicare payment rates are expanded to cover a significantly larger portion of the population. You can listen to the interview here. Earlier this week, I offered comments regarding a New York Times/CBS News poll that claimed 72 percent of Americans supported the creation of a government-run health plan. I said that the idea of more choices would always generate an overwhelming “yes” answer if respondents were not apprised of the possible consequences of the policy change. This morning, the Washington Post and ABC News echoed this comment. It’s a privilege to turn this blog over to a Healthcare Leadership Council member, Dr. Herb Pardes, the president and chief executive officer of New York-Presbyterian Hospital. 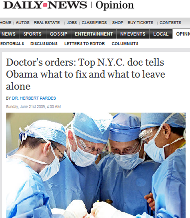 Dr. Pardes had an excellent op-ed published this weekend in the New York Daily News, focusing on ways to reduce costs that are threatening access to care. Those who advocate government-run healthcare have seized upon a New York Times/CBS News poll published yesterday that shows 72 percent of Americans support the idea of a government health plan competing with private insurers. I can understand advocates cheering this survey without question, but I’m a little disappointed in many of the news stories and journalists’ blogs I’ve seen that cite the NYT/CBS data without putting it in perspective or asking questions about its actual significance.